Organifi is an organic, superfood supplement line that makes quality trusted nutrition convenient and accessible. It’s quick and easy with no mess and tastes great! Their most popular product, Green Juice, solves the problem of juicing greens ON THE GO! Just add to water, drink and let your body soak up the benefits. Organifi Green Juice is how I upgrade my nutrition when I’m on the road. Every single person needs to have a green superfood supplement in their life, because even if you’re eating really healthy, your veggies lose a ton of their nutritional value just sitting on the shelf or in the refrigerator for days before you eat them. Not all of us have the time or the means to always source fresh, organic vegetables … especially when building a business … which is why I love using Organifi Green Juice. It’s so quick and easy and tastes fantastic! Get your daily greens without breaking the bank, around $2 per juice! 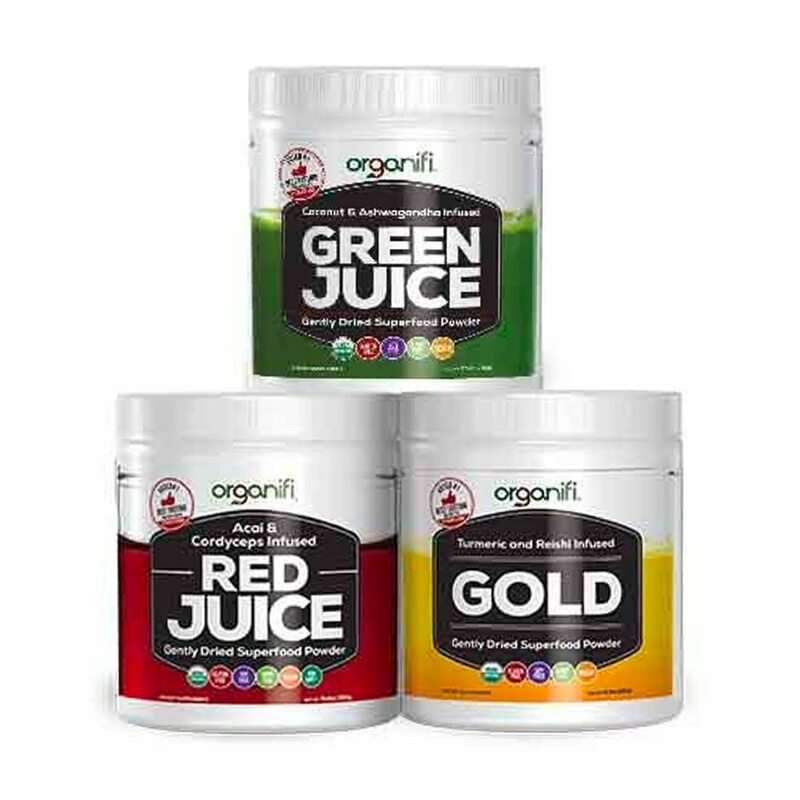 Organifi Red Juice is a superfood Red Juice powder packed with antioxidants and immune boosting herbs. Add a scoop to water or almond milk to get your daily boost … and it tastes amazing! Get an antioxidant boost from all your favorite berries. Boost your energy and immune system with reishi and cordyceps mushrooms. Also has powerful adaptogens to support general system balance. Organifi Complete Protein is an organic, plant-based protein powder that contains proteins, healthy fats AND vitamins from WHOLE FOODS. Complete Protein is an organic plant-based protein blend. Most plant-based use rice protein as a filler because it's cheaper but has been shown to cause gut irritation. Contains whole-food vitamins and minerals. Most supplements use synthetic vitamins but ours are whole-food based vitamins so they actually have higher bioavailability. You absorb it and don't just pee it out. Contains 5 digestive enzymes to break down fat, protein and starches and eliminate bloating. Many other protein powders cause bloating. Includes MCT oils – healthy fats that can keep you fuller longer. The core of Organifi Gold is turmeric. This anti-inflammatory spice is one of the favorites in the Organifi kitchen, with over 8,000 published studies and articles showing its numerous health benefits. They combined turmeric with smooth coconut milk, cinnamon, ginger, lemon balm and two super mushrooms to create a warm relaxation beverage. Reducing stress and getting sound sleep are some of the absolute best things you can do for your health and this is exactly why they made Organifi Gold. The Organfi probiotic contains 10 potent strains of probiotics and 50 billion colony-forming units (CFUs) all in one easy-to-take capsule. They formulate with the highest quality ingredients and absolutely no fillers, milk cultures or hidden grain-based ingredients. The gut is the heart of health and keeping it in great condition requires a generous amount of beneficial bacteria. Click here to get your Organifi products now and use the code there at checkout to save 20%!